Free breakfast at the restaurant was excellent. The room was very spacious and clean! The kids had lots of room to play on the floor if they wanted to. It's a small town with friendly folks. We were comfortablearea, very relaxing with restaurant Attached which was a plus. Free breakfast, Staff friendly and big rooms. Pet friendly, pet area and pool for summer. Really is Nice place to lay your head and kick it back. Large room! Restaurant on site Dodd was excellent! Convenience and location. Great restaurant and good prices. Very comfortable bed. We will make this hotel and annual stop on the way to Colorado each year. The restaurant was excellent for so-called Mexican food. It's hard to pass when you're from South Texas. I was surprised that it was an old style one story motel. The restaurant staff was very cordial,but the food was o.k. at best. One thing that was great was the abundance of hot water and the water pressure in the shower was great. I liked the bed because it felt more like our bed at home. Casa Lemus definitely needed some sprucing up. I think mainly cosmetic like paint and more modern counter tops in the bathroom and new carpet in the room. There were some tacky window shades in the windows above what must have been the old lobby that if they were just taken down would be a big improvement to appearance. Couldn't beat the price though, but we would be willing to pay a little bit more to spruce it up. Raton is in a beautiful region. I wish they could revitalize the town to attract more visitors. The bed was extremely hard. 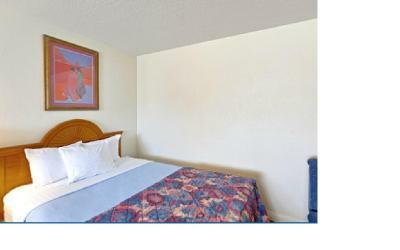 It is an older motel-style room, that could use updating. The bathroom was large a accommodating. This motel reminded me of those quaint 60s roadside motor lodges. Unfortunately that expectation was not reality. This is a property in transition. The rooms have been redone and were clean and comfortable. The rest of the property needs major work! I hope they can return it to the glory days depicted in the pictures. Casa Lemus Inn & Restaurant This rating is a reflection of how the property compares to the industry standard when it comes to price, facilities and services available. It's based on a self-evaluation by the property. Use this rating to help choose your stay! 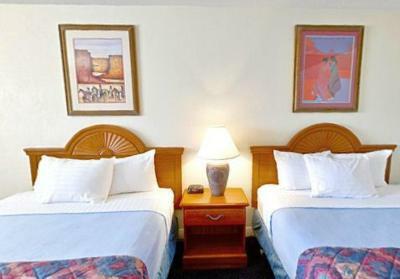 This Raton hotel is located off Interstate 25 and is 15 minutes’ drive from Sugarite Canyon State Park. 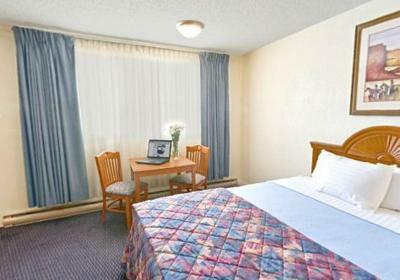 It features an American restaurant and rooms with free Wi-Fi. 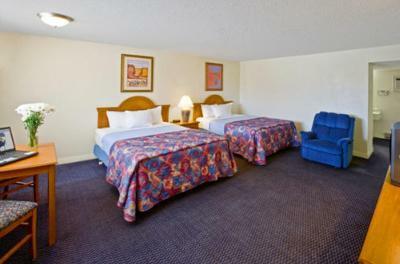 Each spacious room includes a coffee maker, cable TV and a comfortable seating area. 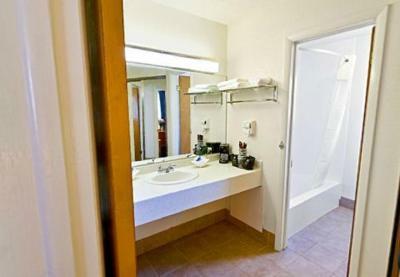 A work desk and ironing facilities are also provided in rooms at Casa Lemus Inn & Restaurant. The on-site restaurant serves Mexican and American cuisine 7 days a week. The outdoor courtyard offers barbecue facilities and picnic tables. A business center is located in the lobby and the front desk is open 24 hours. Raton Convention Center is just 1 miles from this hotel and New Mexico Highlands University Raton is 1.4 miles away. Raton Pass, a historical landmark, is 20 minutes away by car. When would you like to stay at Casa Lemus Inn & Restaurant? This air-conditioned room includes a cable TV, a work desk, a sitting area, a microwave, a refrigerator and a coffee maker. House Rules Casa Lemus Inn & Restaurant takes special requests – add in the next step! One older child or adult is charged USD 11.50 per night in an extra bed. Casa Lemus Inn &amp; Restaurant accepts these cards and reserves the right to temporarily hold an amount prior to arrival. Casa Lemus Inn & Restaurant accepts these cards and reserves the right to temporarily hold an amount prior to arrival. Please note that there is an additional fee for having pets in the Queen Room - Pet-Friendly room type. Contact the property for more information. Stucco workers working on the stem wall on the roof there were so may rooms they could have given me. Also all the remodeling that is going on in all the choice hotels is being done by unlicensed workers because the workmanship is of the poorest quality I have ever seen. Something not right!!! Everything, except for the bed,got back aches. No hot water for hours! Dirt blowing in under door and threw windows! Beds uncomfortable! The contractor who did the tiles in our bathroom did a poor job which I reported to the front desk. Once that is fixed it should be great. We didn't use other facilities as we were just driving through town. Other than dust on the bathroom base tiles every thing was clean. Construction equipment working past nine in the evening right outside the door. The property is good. We were travelling to Colorado and stayed there on the way at night. It exceeded my expectations as a small town Inn. The room was comfortable for a family of four adult and a toddler. My family liked it. you cannot compare it with any big city hotel but it was wonderful from a small town perspective. And the Restaurant attached to it which gave us complimentary breakfast was awesome.